I don’t often think about laser tag. Maybe my life would be more interesting if I did, but it’s just not frequently on my mind. However, I was thinking of that childhood adventure game as I walked up the stairs into A.R.T. New York’s theater building in Hell’s Kitchen. There, I was handed a square of grey foam that I held to my chest like a shield as I walked into a industrial-feeling room constructed of black rubber milk cartons. Not that I was about to be faced with beams of light and fog. Not yet. I was here to see a play. The play I was there to see was Samara, the latest by Richard Maxwell of New York City Players. 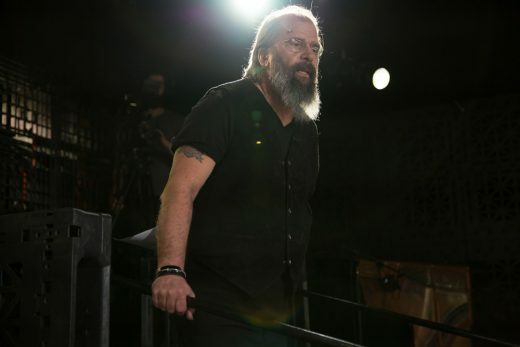 Rather than directing his own work as usual, he brought on Soho Rep’s Sarah Benson to take the reigns and folk singer-songwriter Steve Earle to compose the show’s haunting and unusual score. 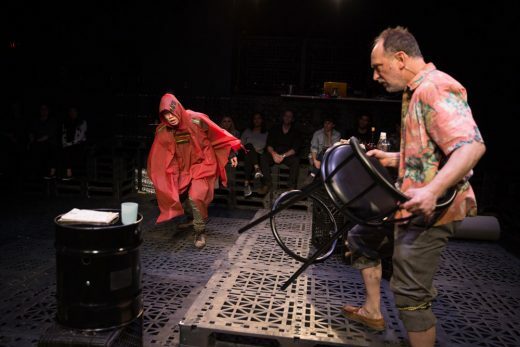 Samara is one of the productions Soho Rep has done since leaving their longtime home of Walkerspace, but during the run of the show the theater announced that they would in fact return to the Tribeca theater for their 2018 season. Though this was by no means actually a game of laser tag, the set and world of Samara felt an awful lot like a gritty, fantastical video game. (For the record, the aforementioned foam shield-square was for sitting on.) Close to reality, but with a heightened sense of action and objective. 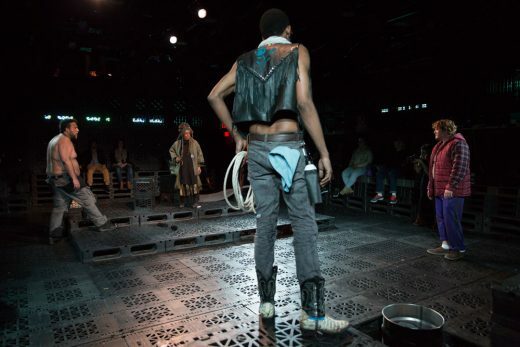 Colorful anachronisms abound in the dystopian-seeming landscape (scenic design is by Louisa Thompson and lights by Matt Frey), as Nike-branded sweatpants mingle with hero’s journeys in this tale of a messenger boy seeking to collect his wages and what goes wrong along the way. As much as I would love to do what so many other critics have done and wax poetic about the western genre and how it’s entangled with the classic Greek tragedy in this play, I can’t say that’s where my mind was when watching the show. I don’t doubt it was engaging with those ideas and structures quite intelligently, but maybe I’m not well-read enough to have such framing at the forefront of my mind. That’s not to say I wasn’t affected by Samara. For me, the poignancy came not from its playing with genres, but its eventual absence of them. Specifically, the transition near the end where I thought the play was ending. All the actors left the stage and the room grew very dark. So dark and still, that it felt like we could be the wayward travelers depicted in the play, preparing to sleep under the stars. Steve Earle’s enduring voice then floated into all of our ears, drawling a fireside tale about a bird and a traveler and horses and life and death. I don’t even have a very clear memory of what Earle was saying in that voiceover. For me, content was not king in that moment. He probably could have said anything, honestly. Somehow, the combination of an empty stage, an intimate voiceover, and a dark room that slowly became filled with fog and light made me immensely emotional. Additionally, I think this moment for me was when Earle truly shone. A gruff folk musician standing at a music stand and reading stage directions is one thing, but it’s still firmly rooted in theater with a capital T. When no one was on stage and Earle’s rough-yet-kind voice trickled out of speakers we all suddenly learned were intimately all around us, it no longer felt like we were watching this strange world, but belonged to it. As it turns out, such a shift can have an intense effect on the soul. Though I am indeed no scholar, I do see the Grecian comparisons. When you look to the Greeks, time and time again you see a sole tragic event vastly changing the course of people’s lives, and sometimes an entire society. Human tragedy remains a common trope in stories today, but the constantly somber news cycle has made it a bit easier to brush off, say, one death, holding off on emotions until one is sufficiently bowled over with grave statistics harrowing enough in scale. Perhaps it’s the video game feel of Samara that is most subversive for me, then. I’m not sure if I can think of another genre in which death and violence is treated as so mundane and everyday. And yet here, when a mother is faced with the death of her boy it is rightfully devastating, enough so for everything to change. Samara, written by Richard Maxwell and directed by Sarah Benson, continues through May 14 at A.R.T./New York Theaters.